“To become “taronyu” hunter, you must choose your own Ikran and he must choose you.” A famous quote from the movie, Avatar that came out in 2009. If you’ve never watched Avatar, we’re speechless, you better watch it now. We’re pretty sure everyone would still remember the highlight of Avatar — Pandora. Mesmerizing and beautiful, enchanted forest, it’s like a magical land. 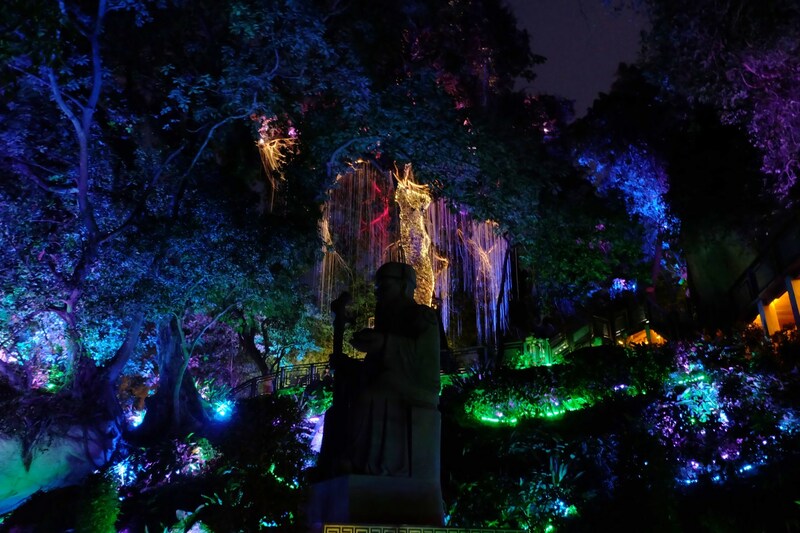 So did you know that you can find “Pandora” in Penang as well? It’s the Penang Avatar Secret Garden. Nestled in Tanjung Tokong, behind the Thai Pak Koong Temple is the Pandora inspired secret garden. The Penang Avatar Secret Garden was a project by MBI which turn this piece of greens into a neon fantasy. Neon LED lights are draped and wrapped at the branches and trunks of trees. Finding your way to the Penang Avatar Secret Garden might be a little tricky. At the traffic light further down Tesco Tanjung Tokong, turn right. Go all the way in and you’ll find the place. At 7:35 p.m., watch the garden turn into a magical land. Entrance is free, though you have to pay RM3 for parking if you’re driving. We suggest you to come earlier to catch the sunset and take some great pictures of the shore ans statues before your Avatar adventure. The view is pretty awesome, overlooking the sea and skyscrapers. Moving on to the Penang Avatar Secret Garden, we’ll let the photos do the justice. The neon lights in different colors creates a peace of mind. Do mind that there are quite a bit of stairs to climb and difficult to see when the sky gets dark. So watch your steps and be cautious. Overall it was a great experience, putting aside the heat and sweat. The Penang Avatar Secret Garden was truly a piece of art, and definitely has the Pandora vibe from Avatar. However, we think that this is a one-time experience as you’ll eventually get tired and bored after visiting a couple of times. Address: 336, Jalan Tokong Thai Pak Koong, Tanjung Tokong, 11200 Tanjung Bungah, Pulau Pinang. Opening Hours: 8 a.m.-12 a.m. (Daily) Light Turns On at 7:35 p.m.
Hi, do you have any contact info regarding this place ?